Competition closes 1st November 2018 – winner announced w/c 5th November – GOOD LUCK! 1. Entries must be made by the parent or legal guardian. The competition is open to families who reside in the United Kingdom, Channel Islands, Isle of Man and Republic of Ireland, except employees and families of the promoter and its affiliate companies, agencies and anyone professionally connected with the promotion.2. Entrants enter the promotion by buying posting an image of their carved pumpkin to social media and tagging Venture Studios UK in their photo. 3. Entrants to this campaign agree to have their family name and photo posted on the Venture social media channels. 4. The Pumpkin Halloween competition starts on the 2nd October and ends on 1st November 2018. 5. The winner will be announced the w/c 5th November 2018. 6. The winner will be selected by a panel of judges. Details of the judge’s decision can be obtained by contacting Marketing Department, Venture Franchise Services Ltd, 62-64, North Street, Leeds, LS2 7PN. The decision of the judges is final and no correspondence will be entered into. 7. 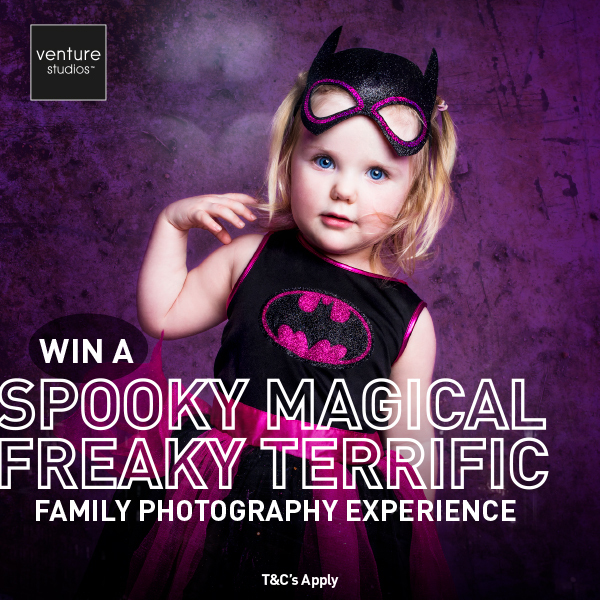 Winners Prize: A Silver Family Photography Experience which includes a 10″x8″ framed gift worth £165. 8. All prizes are non-transferable. 9. All winners may be required to take part in any relevant publicity and products featured in Venture marketing communications. 10. The Promoter reserves the right to withdraw or amend this promotion in the event of any unforeseen circumstances outside their reasonable control. 11. Terms and Conditions for the Venture Experience apply throughout the competition. 12. The names and regions of the Winner will be available by contacting Venture Marketing by post Venture Franchise Services Ltd, 62-64, North Street, Leeds, LS2 7PN. 13. This promotion and these terms are governed by English Law and subject to the exclusive jurisdiction of the English courts. 14. Promoter: Venture Franchise Services Limited, 62-64, North Street, Leeds, LS2 7PN. 15. Venture is a franchise business therefore participation in this promotion is at the individual studios discretion.